A CONCERNED CITIZEN documents the work of Dr. Riki Ott, a whistleblower who predicted the Exxon Valdez oil spill hours before it happened and came to the aid of her Alaskan community in their battle to get fair compensation for their loss of health and income. More recently Riki, a toxicologist, author, and activist, has been organizing the Gulf coast communities as they struggle to recover from the BP Deepwater Horizon disaster. Taking the lessons she learned as an activist, she is also spearheading the campaign called Ultimate Civics, a complete civics curriculum she developed that empowers students to participate in their democracy. Recognizing the power of money in politics she advocates for a constitutional amendment to end corporate personhood, and to reform campaign finance laws. She lectures nationally and internationally, inspiring students from fifth grade through universities and adults to take action and showing by example how one person can make a difference. "It is my hope that, as people's health, livelihoods, and property are harmed by these extreme oil activities, people will understand the need to shift off oil to safer energy options and take action to achieve true energy independence. This is the movement that I see growing in all regions of our country." "A Concerned Citizen presents complex ecological problems and troubling trends. This is a clarion call for people to get savvy and reclaim democracy by speaking out. See this film; be dedicated, persevere, and be the change. We'll all be healthier if you do, including the planet." "This film is not just about oil spills and environmental activism. It is about the critical link between the concentration of economic power, and how that has led to the concentration of political power. Every citizen, regardless of where they are in the political spectrum, needs to understand how political polarization is driven by wealth polarization. We can have a more responsive democracy by learning the lessons offered in this film." "Dr. Ott has used her voice as a scientist, activist, and citizen of the world to bring attention to the dangers of our fossil fueled society and the disproportionate health and environmental impacts experienced by people of color and low income communities. The reason why this film is powerful is because this story doesn't end with telling us about the problems we face. Instead, it provides the viewer with both a history of how we got into this environmental mess, as well as a roadmap for how to move forward...Best of all, we learn about ways that we all can get involved in creating authentic democracy. Highly recommended!" "A Concerned Citizen beautifully captures the sights and sounds of the places and people that Riki has dedicated her life to protecting and educating. We see the ecosystems in peril and hear the concern of citizens, and then experience Riki's approach to empowering communities through knowledge and the confidence to act. Through testimonials and her own insights, viewers walk away inspired by her life's work and catalyzed to take action." "Excellent...Dr. Riki Ott's sense of the future follows a vector that leans toward those who will celebrate Earth Day in 2101. That vector is civics. It gives permission for youth to argue that their inheritance trumps short term gain because Ultimate Civics teaches them to give themselves permission to shape now what only they will live to see in 2101." "Riki is one of the everyday citizens who will inspire more grassroots heroes and activists in America. They are sorely needed in this day and age." 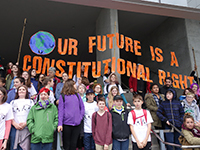 "A Concerned Citizen is terrific, especially at the time of the Youth Climate Strike. This film documents the movement to curb the accumulating disaster of the fossil fuel economy and revitalize our democracy. It ranges from an eloquent scientist-activist to the accelerating student protest movement. It couldn't be more timely or informative, and is inspiring for a wide range of audiences." "This beautifully shot film uses one woman's story to give a powerful message about the link between threats to democracy and threats to the environment. It reminds us that each individual has a role to play and that 'science and civics...go hand in hand.'" "Riki Ott is a tireless scientist/activist/educator who has devoted her life helping people and communities across the country take back their destiny fighting corporate greed and government regulatory failure. This inspiring film captures her indefatigable spirit and passion for democracy and a sustainable planet. Let it inspire others to take up the cause she so ably champions."